 As a part of not taking ourselves too seriously, Zach and Pastor Hoffman started calling their podcast "bush-league". It is a term for baseball players who are professional, but not Major League. In other words, Zach and Pastor Hoffman know there are some awesome places to learn about Lutheranism, so although we don't take OURSELVES very seriously, we always take theology seriously. If you want to be a part of our growing family on facebook, just click Here to join.